Accessorize your uniform to add a unique, tailored touch to your company look. Get the what, why and how of uniform accessories from our specialists. Mix them up with a few, carefully chosen accessories to create an individual identity – and make your employees stand out from the crowd. Create a tailored uniform appearance with featured details to highlight the corporate identity and culture. Just think of how companies use standard items (belts or ties) as a signature feature. China Eastern, Aegean Airlines, Virgin Australia and Air France do. Scarves, shawls, gloves and hats offer another opportunity to tailor your brand look. Scarves and shawls are signature accessories in any aviation uniform package. They are elegant and make flight attendants easily recognizable to customers. Thus, incorporate scarves (shawls, if fitting) into your solution to make your employees catch the eye of customers ➜ and represent your brand in style. Elegant. Stylish. Chic. Exclusive. Luxurious. 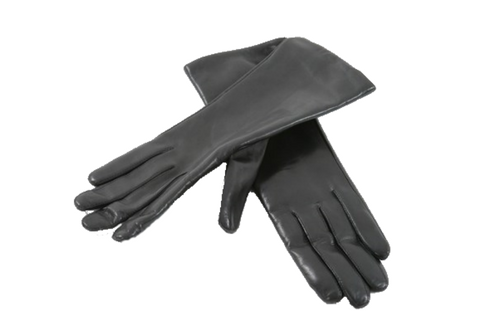 Or use leather gloves to add a unique touch. Alitalia, Norwegian, Air France and Flytoget do. These brands add contrast with leather gloves in contrasting colors, while enhancing their stylish and elegant appearance. In aviation, hats have long been the centerpiece of cabin crew uniforms – and have reached iconic status. They make employees stand out, add a sense of professionalism and look great. Emirates Airlines use their cabin crew headwear (red hat with white scarf) as a prominent feature in their marketing. While the golden Oryx on cabin crew headwear at Qatar Airways is a mainstay in their brand look. Takeaway ➜ carefully selected accessories can elevate your brand appearance. Be on point with the little big details. They matter. So too their signals. Senior employees might use ranking stripes or epaulettes to signal their rank and position. While pins, flight wings, tags or similar insignia encourage a sense of belonging and professional pride. Add to your uniform solution if fitting, but be aware of pitfalls. Features can highlight a professional look and portray your brand identity. However, they can do quite the opposite as well. Tip ➜ keep it professional ➜ Align color and design to match your solution. Reach out if you have any questions – or would like to viev our solutions for inspiration.